Etobicoke Yacht Club in Toronto was the host to this major event, the second largest F18 gathering in North America. Matt was the principal race officer and designed the event logo (left). Hosted by North Cape Yacht Club in LaSalle, MI on the western end of Lake Erie, the A Cats feature some of the highest technology in beach catamarans. Matt was the principal race officer, did the scoring and designed the event shirts. Held on Lake McConaughy, NE over Labor Day weekend, Matt was the principal race officer, did the scoring, was chief judge, managed the Facebook page and designed the event logo. Hosted by the Racine Yacht Club in Racine, WI on the western shore of Lake Michigan. Matt was the principal race officer for the F18 Course which had 51 competitors from all over the continent and a few from Europe and Australia. The event was covered live by Sailing Anarchy. Superb hospitality was the theme at this event, held on Lake Superior and hosted by the Marquette (Michigan) Yacht Club. Matt was the principal race officer, chief judge and made a lot of new friends. The Bemis, Smyth and Sears Championships are the US SAILING National Junior Championships for singlehanded (Lasers), doublehanded (420s) and triplehanded (Lightnings) boats. This was the eastern Great Lakes area qualifier for the finals held in San Diego. Run out of Matt's home club (Crescent Sail Yacht Club, Grosse Pointe Farms, MI), Matt was the PRO for the Laser / 420 course. Rock Hall Yacht Club hosted 178 juniors from six states and twenty different junior programs at their fantastic club on the Chesapeake Bay. For the first time in JO history, multihulls and windsurfers were included. Matt was the PRO for the Hobie 16 circle and served as the chief judge. A return trip to Bath, Ontario Canada for Matt, serving as principal race officer and on the jury for the event. Matt's long-time friend, John Hooper from Australia, helped set marks and served on the jusry as well. The highlight of the event was being told by Dr. Stuart Walker, "The line's too damn short!" Due to the Gulf Oil Spill and the cancellation of the Hobie 17/18 North Americans, Matt had this weekend free, so he was a B.I.M.B.O. - riding the weather mark boat with Gary Viola from Bayview YC. Nice to be able to relax and just pluck and chuck marks for a change. Match racing is always a intereting time, like two gladiators clashing with sword and shield. Held right off the breakwall of Bayview Yacht Club in the Detroit River, Matt was the PRO for this ISAF Grade 3 event that served as a qualifier for the ISAF Grade 2 Detroit Cup in September. Held on Base Line Lake and hosted by the University of Michigan Sailing Club, Matt served on the protest committee with Brook Smith and Clark Chapin. 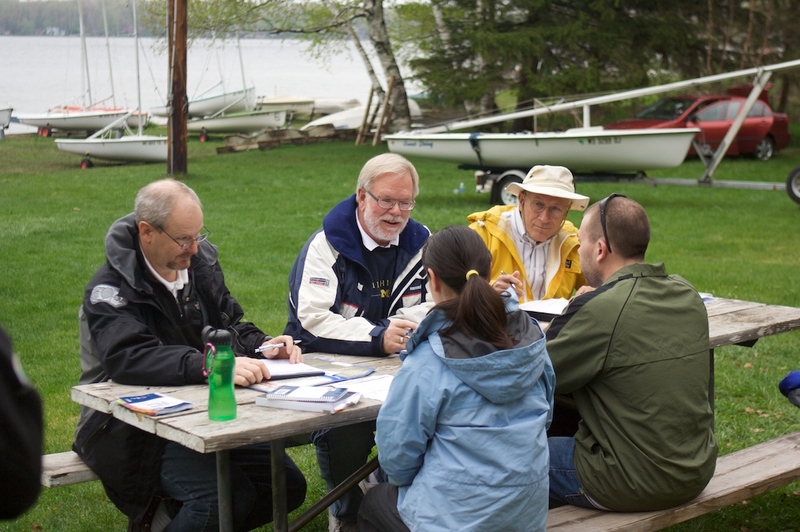 A photo of the hearing was used to illustrate a Sailing World article on protests. Our decision was held up on appeal which has become Appeal 105 in the US SAILING Appeals Book.